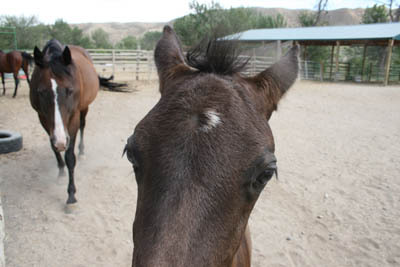 Try as I might to find to find some definitive sign that I should or should not do Tevis, nothing happened. There was no lightning bolt from the sky (that would have just ended it), no FEATHER from one of the SIX Ravens that landed in our tree Tuesday morning (I would have packed up and left for Tevis within the hour! ), no chasm that opened up under my feet, no deep VOG (Voice of God, for those who've worked in theatre) from the great void saying, "Ride, silly!" I DID hear a lot of friends' voices; and none of the cautionary woes - my bad aversion to HEAT, my bad knee - that I mentioned made a dent in their enthusiasm. 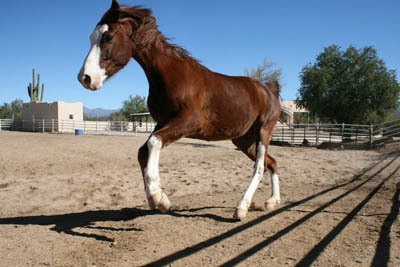 "If you knee gets to hurting too bad, just have a horse step on your foot. Then you won't notice the knee anymore, or at least not as much. Once enough things start to hurt, you just keep on going. It's only for 24 hours, you can handle it." - from Someone who rode with broken ribs. "DO IT. Don't miss it it's THE MOST BEAUTIFUL RIDE EVER" - from a dirty old man with a knee problem. "You were gonna buy the Cool vest ANYway" - from a fellow heat-challenged (photo) shooter. And more advice: wear a Cool Vest (someone is loaning me one), Cool Bandana (hey, I'm already wearing one in Oreana to try to cool down! ), a Cool helmet liner. Stay hydrated. Keep damp. Take LOTS of good drugs (like anti-inflamatories) for the knee. Ride vet check to vet check, or just around the next bend, or just to the top of the next hill. Step by step. And many, many email and phone best wishes and hugs and kisses. Unanimously, the response was: GO FOR IT! But in the end, it was Jose that led me up the rim trail Tuesday morning (had an awesome ride on him), my guru Kevin who pushed me to the edge of the precipice Tuesday noon (talked to him on the phone for advice), and my hero Julie Suhr that kicked me over the top Tuesday afternoon (she answered my email). Julie's words of encouragement brought tears to my eyes, including the final "And you can do it, Merri. I'll cheer for you at the finish line..."
I'm lucky because I haven't had 2 weeks or 2 months to worry about the horse (he's all ready, and Nance and Bruce are already on their way to Robie Park), I've stopped reading about the trail (don't need to start fretting about steep drop-offs), I'm just ignoring my knee, and I'm not thinking about the heat. I'm just going to go ride - back in the Sierra Nevada mountains that I've been craving - and have fun! Thanks everybody - see you all at the finish! He still gets nervous, even though he's got silver Tevis buckles coming out of his ears, and Tevis dust flowing through his veins, and his finish record is way above the finish average of just over 50%. You'd think he'd have it all down pat by now. "Tevis is a tall order. It's tough, tackling 23,000' of down and 19,000' of climbing; it's a hard reality. The Sierra Nevadas are beautiful, but daunting. It's in the middle of summer and hot - you know what's before you, but it can still defeat you." 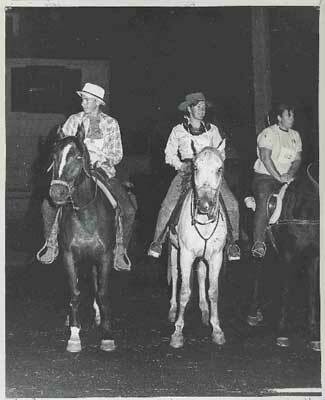 Hal Hall rode his first Tevis at 14 years of age, in 1969, and he finished his first one at 15. He won his first one at 19. He's crossed the finish line in first place three times; three times horses he's ridden have won the Haggin Cup (Best Condition). 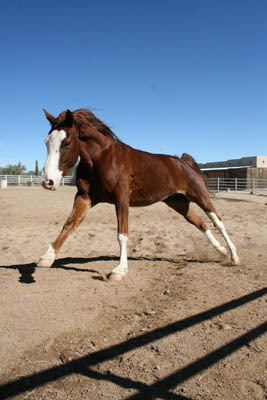 "Each horse is a unique athlete; you play to their strengths and seek to improve their weaknesses. 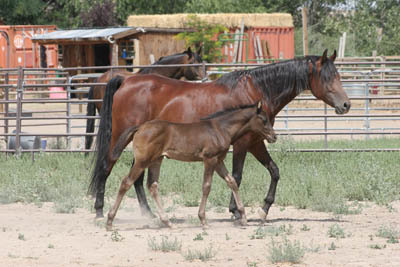 It can take 6 months, or even years or more to get a horse to Tevis. 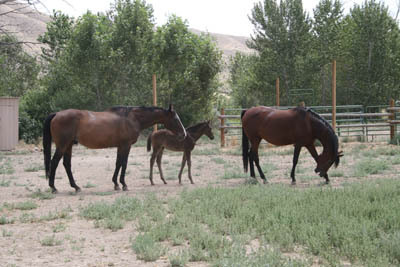 Usually it's a three year project, from the time the horse starts endurance at 5 or 6, until by the time they are 7 or 8, it's time to try Tevis." He's noticed a commonality among his Tevis finishers, and that's a bond he usually develops with them, after months of training and then getting through the Tevis. 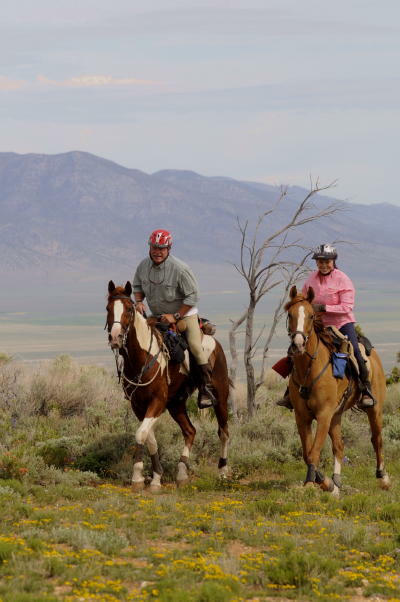 And why does Hal ride the Tevis year after year? "It all started with the Tevis. I grew up with it; it was the center of my universe for some time. Fortunately I started early, grew up with horsemen and women I learned from, then applied what I learned. Of all the endurance competetions around the world - and I've travelled the world for endurance - Tevis still ranks the highest, and is the most demanding of horsemen and women." Some years he's taken a sabbatical because he just wasn't up to the months of training and sacrifice - "sometimes I just wasn't in the right frame of mind" - but he always comes back to it, as long as he has a horse that is willing and able. Hal and his wife Ann (who's won 7 Tevis buckles herself) also train horses for Mr Seiichi Hasumi of Japan, who this year is riding for his 6th consecutive buckle. Mr Hasumi had seen a TV documentary in Japan on the Tevis cup 10 years ago, and decided that's what he wanted to do during his retirement years. Not too many people choose that 'relaxing' path for their retirement. On Saturday, Hal will be riding his new horse, Dreamm On, for the first time. 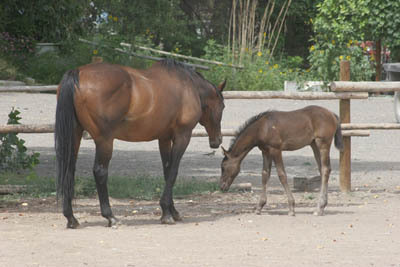 Hal was looking for a new horse to replace his mare that he had to retire, and Dreamm On fit the bill. "He's a veteran of the sport. Caution will be my approach this year, since it will be our first ride together; but I know he is ready for it." Hall will be a familiar sight at the starting line, on the trail, and hopefully at the finish. 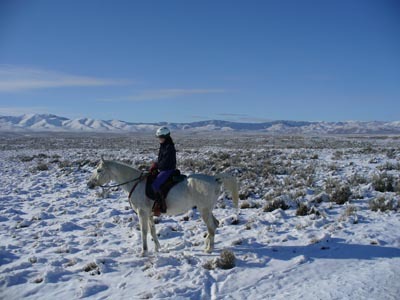 "As long as Tevis is something of a learning curve and adventure, I'll keep doing it." And he'll likely keep adding buckles to his collection. It might sound like a list for a Tevis rider, or a crew-member. But it's for Tevis photographer Lynne Glazer. 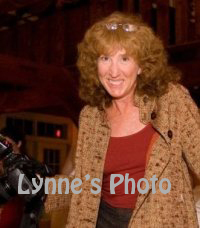 Lynne's been photographing Tevis since 1998, when she started with the webcast. She's been shooting Tevis on her own since 2004, for herself and various magazines. There's a lot of planning that goes into a major event like this, starting with studying what worked and what didn't last year. One has to figure out how to get to which places by what times and who to shoot (all the riders? the front runners? leave one place to time it to get to the next place to catch front runners or mid-pack riders? ), determine the best lighting and angle at the particular time of day the riders will be passing (harsh sunlight and shadows and forest can be particularly tricky; and dust from the trail is murder on camera gear); and figure out how much equipment to carry and how to carry it all. 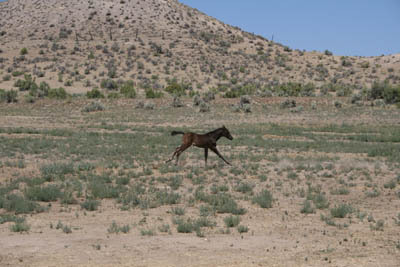 Besides figuring out all of the technical stuff, there's the physical effort of GETTING to those out-of-the-way places - she gets to hike a couple thousand feet in and out of hot, still canyons, just like the horses. And hiking there means carrying all the gear - cameras, lenses, back up cameras and lenses, and water, and if she's going somewhere like the swinging bridge, extra clothing such as wading boots. And those aren't light. There's never really a time to pause to eat or rest from before the start (sometimes she'll start hiking at 4:15 AM) till the last rider has crossed the finish line near 5 AM - and not even then, because there's your booth to man, and the awards to shoot. It's not a job for wimps or the non-motivated. 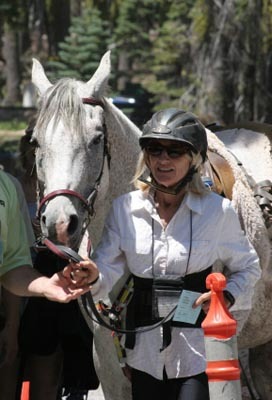 Lynne doesn't just shoot endurance - she's rides endurance also. She grew up in Sacramento - just down the road from Auburn - "the Endurance Capital of the World" where she spent time hanging around and riding the Tevis trail. She started endurance in 1996, and though she hasn't done a ride since 2006 (because of a knee problem, which is better now), there's more in the future, including a stab at Tevis. "Sure, I'd like to ride it one day, on my own horse." Tom Noll was going to ride Nance Worman's horse Big Sky Quinn. On Monday morning, with five days left till Tevis, Tom backed out due to work conflicts. Nance offered her horse to me to ride. The horse is in shape. I just watched him and Nance finish an 80 mile ride at Bandit Springs, and they finished Tevis in 07, the first for both. I'm not too worried about climbing on this horse I have never ridden - I've ridden with Nance and Quinn, and I am (pretty) sure he wouldn't buck me off. I think. Physically I'm not sure about me. You all know how I whine about the heat. I make jokes about it, but it's not just whining - I have a hard time when hits 90*. Tevis is going to be hotter than that. Heat stroke is a real possibility for me, and I'm just not conditioned for extreme exercise in the heat. I have been avoiding the heat, not exercising in it. I'd want Tevis to be fun, not miserable (or worse). And there's my knee. It's been bothering me on and off for years, and pretty much constantly for the last year. Sometimes I can't walk for a while after a 50 miler, depending on the horse and the saddle. And I think I want to ride for almost 24 hours? Is it worth the possibility of blowing out a knee? (Um... maybe...?). And there is that little matter of the possibly broken toe, which I still cannot comfortably get in a shoe and hike on. Ibuprofen will take care of the toe, but nothing helps the knee. Pain isn't THAT big of a deal, but the cost of fixing a destroyed knee - and the time lost riding - is. Another reality IS the cost (registering late, HAVE to have a buckle, HAVE to buy a cool vest or I'd die, etc) - I can ride at least six 50 mile rides (and hurt a lot less, and put real knee damage off longer) for that much money. Monday afternoon, I said, "YES! NO!" This morning I said "NO." Then I went out and had a great 12 mile ride on Jose, and thought, SURELY I could eek out another 88 miles out of me on the Tevis trail!? And I said "YES! NO! MAYBE!" Less than four days to psyche myself up for it, figure out what I'd need, get it together physically and mentally... Oh, and I'd have to leave tomorrow. I know the horse is ready... I don't know that I am. I still have a few hours to decide. 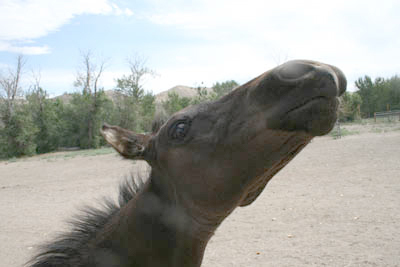 April 29 2007: "What a horse.... I hope to do him justice. I don't think I've ever known a kinder or more personable horse." That was after Kevin Myers' second trail ride on his new 8-year-old gelding Auli Farwk (Far), that he bought from Leslie Spitzer. May 29 2007: Kevin came home from work to a catastrophic injury. 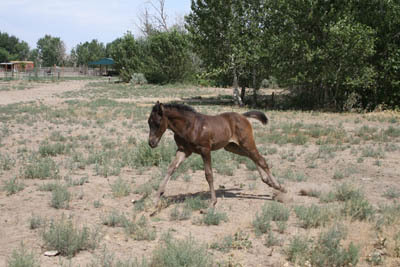 Far was digging under some roots of an old Palo Verde tree in his paddock, and ripped his fetlock open on some exposed roots. He severed his flexor tendon, requiring 94 stitches in 3 layers in 2 hours of emergency vet work. Only a few trail rides on this wonderful horse - and it all might be over. 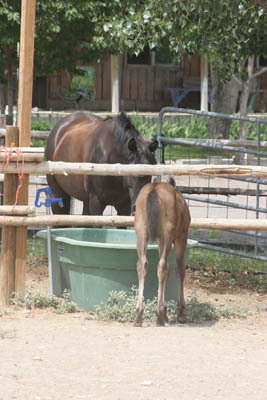 Far spent the next couple of months in a stall in the sweltering heat of summer in Scottsdale - willing and agreeable to everything that was done to him to help him heal. 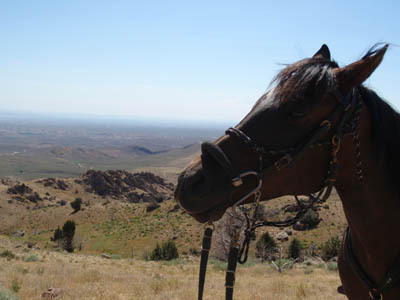 After a steady healing, and a careful, patient rehab, Kevin and Far did their first endurance ride in October of 2007, 5 months after his injury. Far is 15 for 15 now; he and Kevin did Far's first 100 in this year's April Git R Done ride, finishing 8th. "Tevis wasn't even in my plans 2 months ago, but the last 6-8 weeks we've been hauling up to the hills outside of Prescott - to get out of the 115* heat in Scottsdale - and doing hills - lots of hills. 30 miles, and 11,000' of climbing. He's just done so spectacularly, and I'm enjoying him so much - that Tevis called." 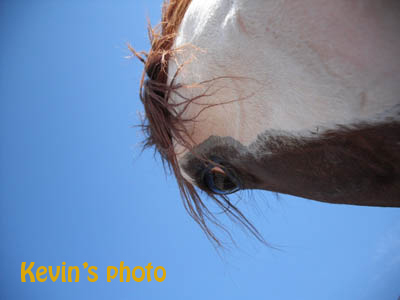 Kevin rode in and completed his first Tevis in 2007 on Clydea and Jim Hastie's horse Muscaczar. Now he's back for his second go at it. "I've been thinking about it - and I don't know why I'm drawn to go back. It's just... the Ultimate. The trail sure makes you feel alive out there. "Maybe I'm doing it again because I'm in awe of my horse. 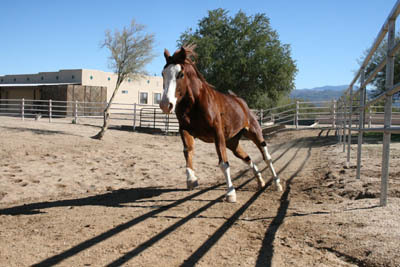 He's an exceptional athlete; I think he's my Once in a Lifetime Horse. I have an incredible connection with him - it's trippy!" 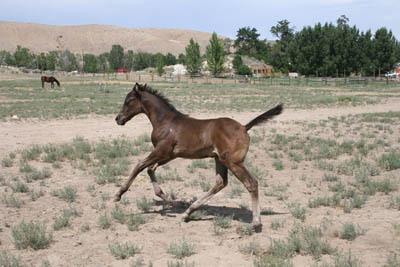 Far is pure CMK Arabian, although Kevin calls him his CRF horse - Crazy Running Fool. Far likes to go. Always wanting to go, always asking for more, he can be a little hard to rate at times. Now that he's done one Tevis already, Kevin is a bit nervous and excited, and has confessed to losing a little sleep over it. And there are two things he's concerned with. One is the start (which, naturally, is the concern of a lot of riders) - Far tends to get excited at the start of rides. 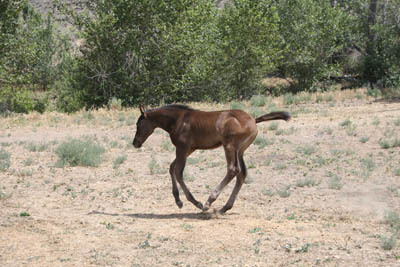 And there will be close to 200 horses starting on the trail. The second is Kevin's body. "Far doesn't have the smoothest trot - he has a lot of loft - so my body's going to wear down at some point." But Kevin will hold up, and he has all the confidence in the world in this horse that has come a long way from a career-threatening severed flexor tendon two years ago. 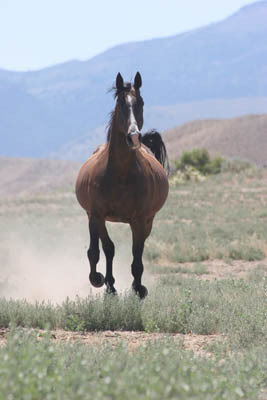 "The Great Challenge of Tevis calls" - on the Horse of a Lifetime. 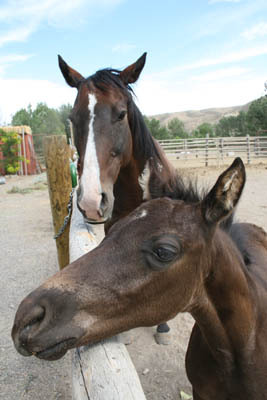 "Watching horses cross the finish line of Tevis makes me cry. Every time." Lucy has been involved with the Tevis Cup every year since 1997 - either taking photos, doing the webcast, or crewing for friends. 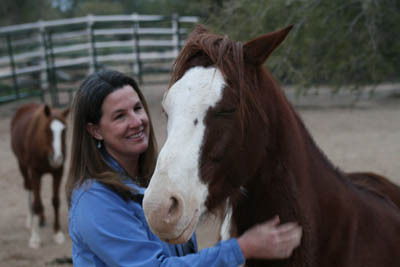 She's wanted to ride Tevis for several years, but she never had a horse that was appropriate for it. 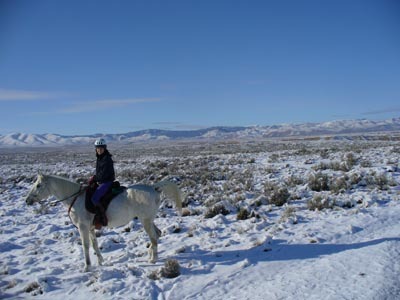 This year, for the first time, she'll be riding the Tevis, and she'll be on her own horse, AM Ruwala Land (Roo). "It will be interesting to be 'on the other side of the fence' this year," she says. Interesting... and maybe a little scary? "He spooks. In fact, he dumped me off Saturday." One might not find that to be the most valuable trait on a trail with many treacherous dropoffs. "Oh it's a regular occurrence. But he's really a good boy, a worker bee." They've both pre-ridden 64 miles of the trail in pieces, from Robinson (at 36 miles) to the finish, so they are well prepared. There IS one part of the trail, after Deadwood, (at 55 miles), that gives her the Heebie Jeebies. "It's a 'one misstep and you plummet' trail." 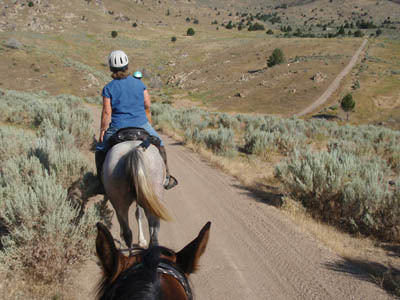 She and her husband were riding it, and the horses tripped and almost went over the edge. "I ride drop-off steep trails all the time, but there's something about that section really really frightened me." How Lucy got to Tevis in the first place is all because of a single photograph. It was on the desk of a co-worker: a picture of an endurance horse going over Cougar Rock. One look at that picture, and Lucy said, "I want to do that activity!" She'd started riding horses thirty-three years earlier when she was 10 years old in Holland. "I only rode in an arena. That's all they have in Holland!" 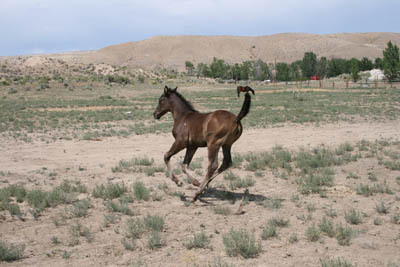 The Cougar Rock photo got her started in endurance in the US in 1998. "I bought one horse... that wasn't really suitable. I bought another horse... that wasn't really suitable. 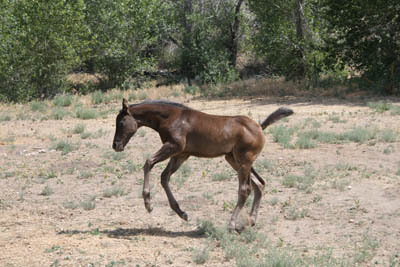 I bought another horse..." Eventually she figured out what she was doing, and now she's riding the Tevis. She has a good partner in Roo. 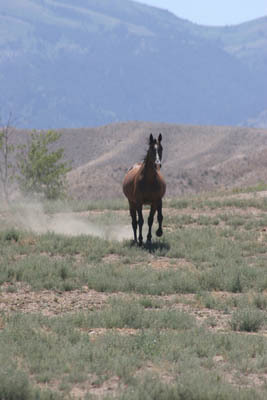 He's a 9-year-old Arabian, with 1740 miles, and has had only 3 pulls in 28 starts. He and Lucy completed the Patriot's Day 100 together last year, so there's no doubt he can do a hundred miles. And he's got a great pedigree going for him also: he's a grandson of the mare AM Xanthium, whom Shellie Hatfield rode to a Tevis cup win (tie) in 1992. This year Roo will be competing against his dam, AM Sands of Time, (the daughter of AM Xanthium), who will be ridden by Marcia Smith. 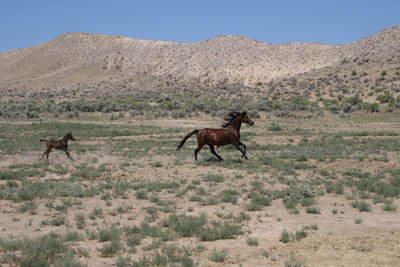 'Sandy' and Smith finished 5th in the 2006 Tevis. "But Roo is not Sandy or Xanthium!" Lucy said with a grin - she's not going to be chasing a top ten placing. While Lucy got a case of nerves a month ago, right now she's in a good place. "Now my To Do list is shorter than my Done list, so things are going good." 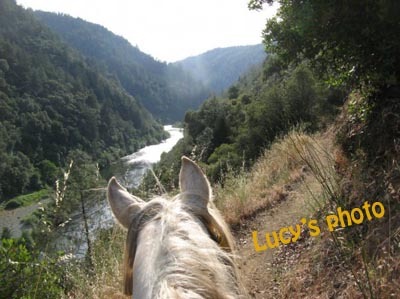 The only thing Lucy is really worried about is dealing with the first couple of hours on the trail: "I tend to dawdle, and you can't do that on the Tevis trail." It will be a great challenge, one she's looking forward to. And if she crosses the finish line on Roo early Sunday morning, you can bet her eyes won't be dry. 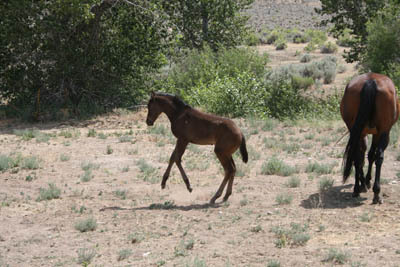 Owyhee Smoke Signals is almost 6 weeks old now. 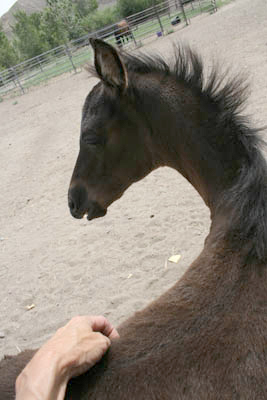 The smokey black filly is still all legs, friendly as puppy dog, cute as... well, a fuzzy baby horse. Steph says, "I think she's the best baby in the whole world! The most beautiful baby ever, and the most intelligent. And the friendliest, and the most curious, and the funniest..." Of course that is a completely impartial observation. 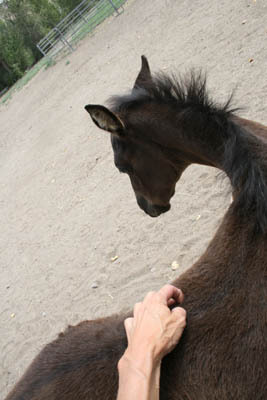 Smokey is pretty smart, as she'll let you touch her all over, and she's already doing very basic natural horsemanship ground work - moving from pressure, letting me throw a rope all over her. Her reward is scratching, because she loooooooooooooves being scratched all over. Smokey and her mom Princess have been hanging out with various herdmates, and the other day, Steph turned a few of them out in the big pasture together. Stormy stuck close by to keep an eye on the little Grasshopper. He goes up to check on her now and again like a dutiful uncle. The herd drifted up the little hill and out of sight for a while, and then Princess and Smokey came running back down to the house by themselves. 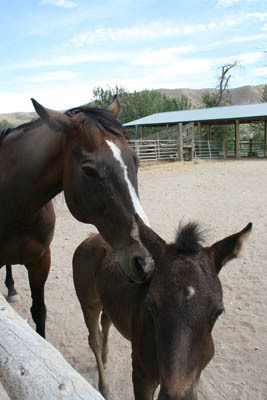 And conscientiously, Stormy came cantering over the hill and back to mama and baby, making sure all was okay. wanders around doing her own exploring. She's not intimidated by anything or anybody, and walks right up to Dudley or Finneas in their pens. She comes up to me for more scratches. Stormy follows. I'd have to agree, she is pretty friendly. And pretty smart. And pretty darn cute. 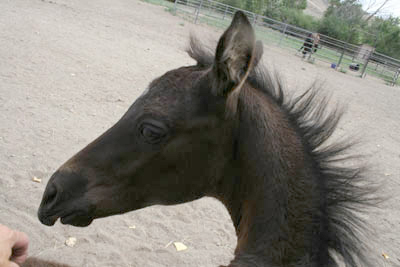 Possibly the best horse baby in the whole world. And I am not biased, only making an objective observation. According to Clydea Hastie, Tevis is One Big Hassle. First of all, there are the complex logistics of getting you, your horses, and your crew organized; the planning, the packing. Their rig driver just cancelled and as of right now - with 9 days left - they no longer have anybody to drive their rig from the starting point in Robie Park to the finish in Auburn a hundred miles away. 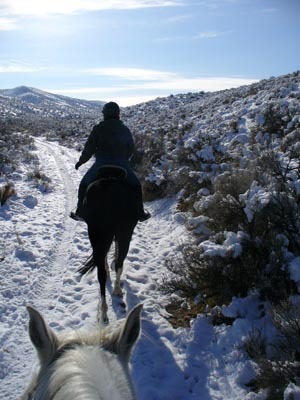 Then there's the trail itself, which is long and exhausting - it's considered by experienced riders who have ridden around the world to be the hardest endurance ride in the world. "The canyons are hard..." Clydea started to explain, then corrected herself. "In fact the whole ride is hard - NOTHING is easy in that ride. It never lets up." It's unbearably hot in some of the canyons: "Down in one of the canyons - of course they had to tell us this, they had a thermometer down there - it was 114* in the sun, and 103*in the shade. And steep - I was tailing my horse up, and there was so much sweat coming off his belly that it looked like urine." And Clydea didn't even mention the constant climbing and descending - 19,000' of "up", 22,000' of "down". And it's by no means a safe ride. "The hardest and scariest part is Forest Hill to Francisco's (miles 68 to 85) - 17 miles of switchback-dropoff-downhill-cliff hangers - at night, in the dark, when your horse is leg weary, with a dead mouth." Clydea laughs, "If anybody is going to cry, this is where it will be." 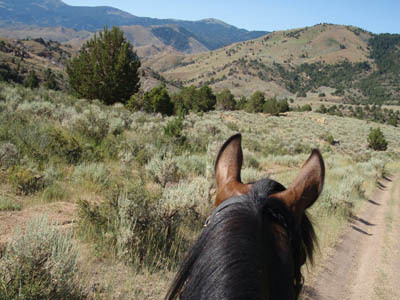 All of that - the prior preparation, the enormous mental and physical stress on the trail - and you have only about a 50/50 chance of finishing the ride, no matter how good a rider you are, or how good your horse is. 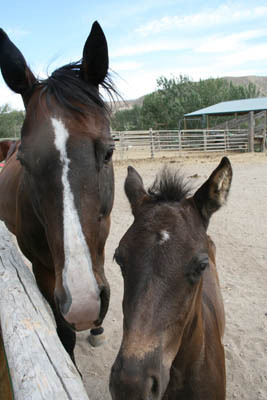 When Clydea finished Tevis in 1990, it was a 43.2% completion rate. So - why on earth would you want to do it? "It's great excitement!" 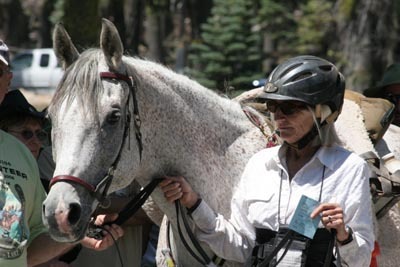 Clydea, 66, started endurance riding in 1969 in California, where she grew up. 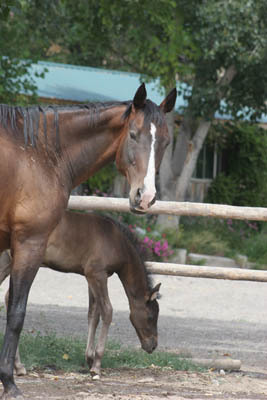 She first rode Tevis in 1970. "Some of the old people riding then are still riding now! And I'm getting excited to see them again. "And when you finish, it's not, 'Oh, boy, I finished a hundred,' it's..." She paused, at a loss for words. "It's a TREMENDOUS achievement!" This year Clydea and her husband Jim, 62 will be riding Tevis together. Jim tried it once before, and got pulled at 90 miles, "so he sure hopes he finishes this time, so he never has to do it again!" Clydea will be riding their horse ("it's mostly Jim's") Frozen Assets (Pepe). He's 6 years old, and they've had him for 1 1/2 years. "He's a French-Polish cross, off the racetrack. He's got great gaits - a great smooth trot which Jim needs for his bad back." He's finished all 7 of his starts, but this will be his first 100. Jim, on the other hand, will be riding WH My Prints (Dakota), a horse that provoked Clydea into laughter when I just asked about him. "He's a screwball! 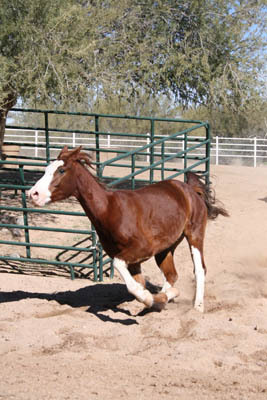 He's an Arabian-saddlebred pinto cross, and he gets into everything. He's a Big Bozo! When he's like that, he portrays his 'Saddlebreddedness.' He's a big strong horse, and opinionated. 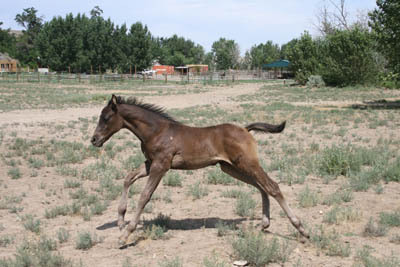 He isn't gaited, but his legs fly all over the place when he gets excited." Dakota has done many multi-day rides, and has 28 finishes in 30 starts, but this will also be his first 100. Jim's been conditioning himself for the ride, running a big hill on foot in Scottsdale in the triple digit heat. Clydea says, "Nah, I haven't been doing that. I have a bad knee." She had an ACL replacement 6 years ago, and downhills still hurt the knee. Fortunately, it doesn't bother her when she rides. Clydea and Jim aren't looking ahead to the finish line; they are taking things one step at a time. "We're hoping to make it through the pre-vet check, then to the starting line, and then we hope to finish." Sounds like modest goals, but in Tevis, they are monumental ones, with an extraordinary reward waiting at the finish line - not just the belt buckle, but the great sense of accomplishment. 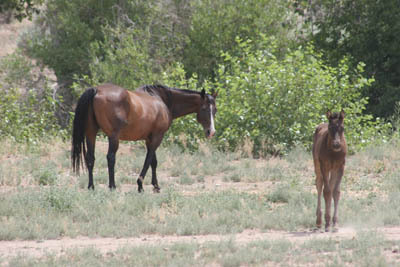 As Karen B said in her Summer Heat Horse Tales blog, "The weather has been HOT but the riding goes on." 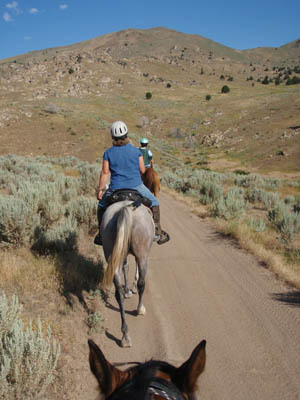 The riding does go on, and there's a little treasure out in the Owyhees mountains if you can brave the heat and your horse can endure the effort in getting there. There's been little variation in the weather the last few weeks except for the digit after the 9: 92, 95, 98, 99. The NOAH forecast just shows a big blazing orange disk in the sky. 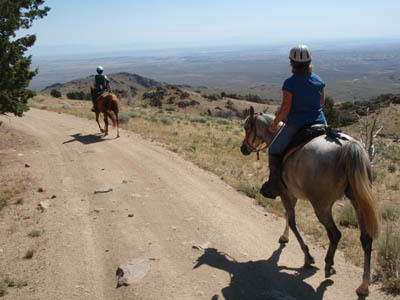 But, if others can put up with your whinefest (i.e., if they can put up with my whining), there's nothing like a new trail to make one (me) forget temporarily about the hardships of riding in the summer desert heat. 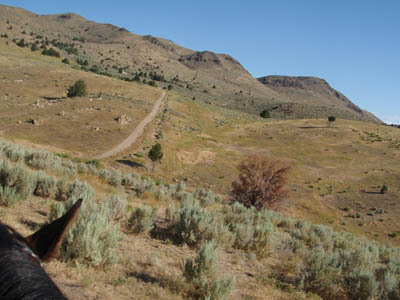 Instead, we did a loop that took us over part of a trail we will one day take to Silver City - an old mining ghost town in the Owyhee mountains that was once one of the leading producers of silver back in the 1860's. Silver City is in the National Register of Historic Places; you can still stay in the original Idaho Hotel, originally built in 1863.
and up and up...and more up. The expansion of the view was proportional to the angle of the ascent (some kind of mathematical formula I've forgotten from school). 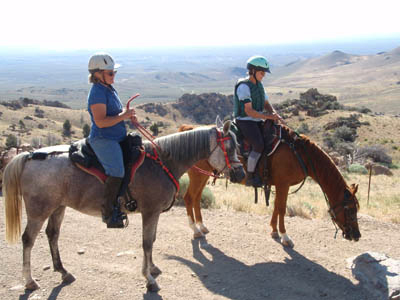 My mount Cinco and Carol's mount Suz aren't fit yet, so they were feeling the climb. We had to stop where it started getting really steep and catch our breaths in the shade; and then they staggered up the final steepest 40 yards. It was possibly the biggest hills these former arena horses had ever seen. Karen was riding her fit endurance horse Gil, and even he was thinking this was a rather amazing horizontally-challenged road, or else he was empathizing with our two wobbling sweatballs. What was REALLY amazing was that someone in a pickup had driven up this road at some point, someone with stronger nerves of steel than me, which we could tell by the fact that their camper shell had fallen off and was over the edge of the road and planted in the dirt on the steep drop-off. Do you think they didn't notice that it fell off their truck? We rode over the top to Milk Springs, and down to Tiddie Springs (really, that's the name) and the North Fork of Sinker Creek. Way down in the valley far below, Sinker Creek is the creek we cross at the Joyce Ranch on some of the Owyhee endurance rides. 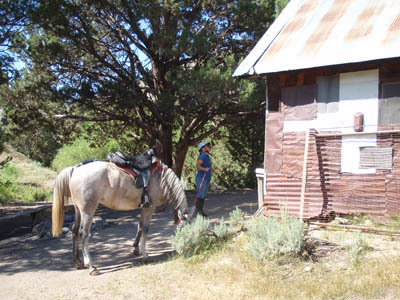 The dirt road along this upper part of North Sinker wove through a juniper forest, and crossed the creek at an old homestead cabin. says: "To anyone that stops here. 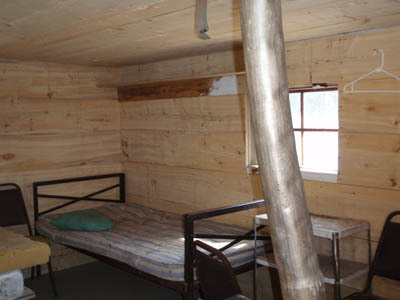 This was originally the Montini's homestead cabin. It is still used as a cow camp occasionally. If you want to stay here you are welcome. Please leave it as good as you found it. Please close the door. Thank you! - Joyce Livestock Co."
Nice or what? 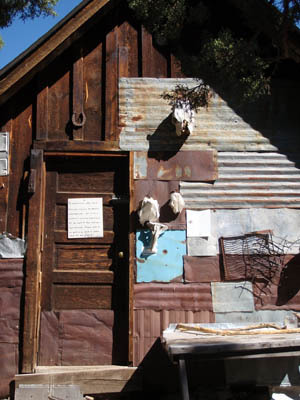 The door was unlocked; inside was a little food and some water jugs, a little pile of firewood for the stove, and a cot. And a guest book to sign. Outside was a campfire ring (some litter in there :> : ( - next time I'll bring a pack to haul it out) under a big cool juniper, an outhouse, and a corral for horses. Oh, all kinds of ideas were popping into my head. But today we left the cool oasis, and made a loop back to the high point we'd crossed. Then we walked on foot back down the steep section, and continued back on down, down, down, to the heated valley floor. Not much of a breeze anymore, and the mercury was climbing. The water in my bottles in my pack was getting near boiling - didn't taste too good or do too much quenching going down my throat, and it didn't cool me off too much when I poured it all over my head, but it was still a good thing to have. 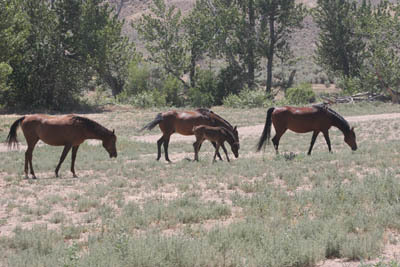 The horses were happy to get back to the trailer, and we loaded up and got the heck outta Diamond Basin before we started to cook. 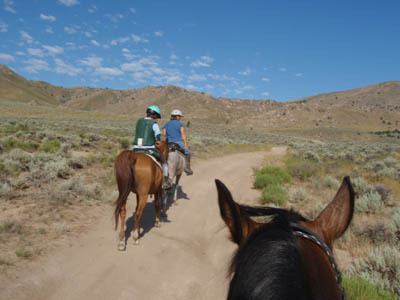 It is a good way to beat the heat in the Owyhees: ride early, discover new treasures where you are welcome. Next time I'll remember to freeze my water bottles overnight.